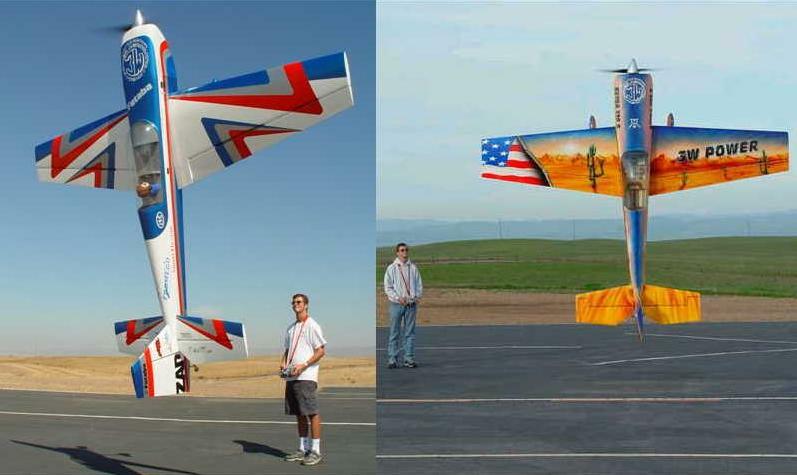 Folding props are also often utilized on Hot-Liners (hot high speed sailplanes), Some pylon type racers and even seen on faux jets which are prop driven. Anything you want to go very fast in a drive can also benefit from a folding prop. 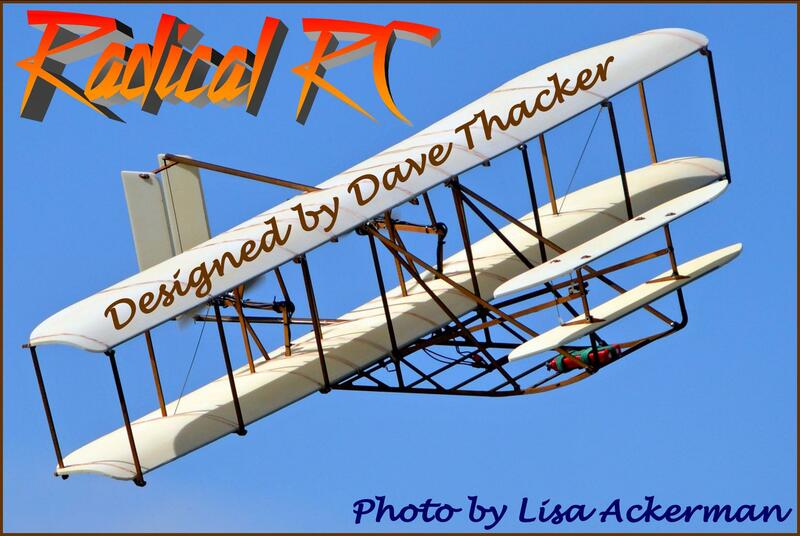 Most props can be cleverly assembled in pusher configuration where the prop folds back over the spinner. We do not stock reverse rotation blades so care must be taken when setting up lateral thrust lines with conventional rotation props in pusher configuration. AeroNaut CAM Folding prop blade set size 12x6, 8mm yoke. Blades only, no spinner or hub. Top quality glass filled. Designed by Rudi Freudenthaler. 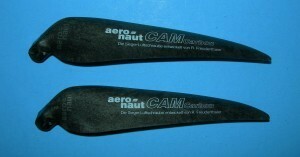 AeroNaut CAM Folding prop blade set size 11-7, 8mm yoke. Blades only, no spinner or hub. Top quality glass filled. Designed by Rudi Freudenthaler. AeroNaut CAM Folding prop blade set size 12-13, 8mm yoke. Blades only, no spinner or hub. Top quality glass filled. Designed by Rudi Freudentthaler. 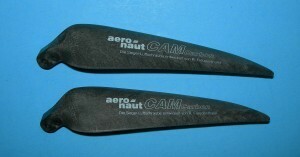 AeroNaut CAM Folding prop blade set size 11-6, 8mm yoke. Blades only, no spinner or hub. Top quality glass filled. Designed by Rudi Freudenthaler. 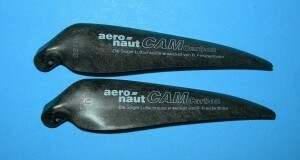 AeroNaut CAM Folding prop blade set size 10-7, 8mm yoke. Blades only, no spinner or hub. Top quality glass filled. Designed by Rudi Freudenthaler. 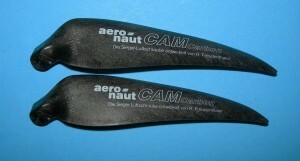 AeroNaut CAM Folding prop blade set size 10-8, 8mm yoke. Blades only, no spinner or hub. Top quality glass filled. Designed by Rudi Freudenthaler. 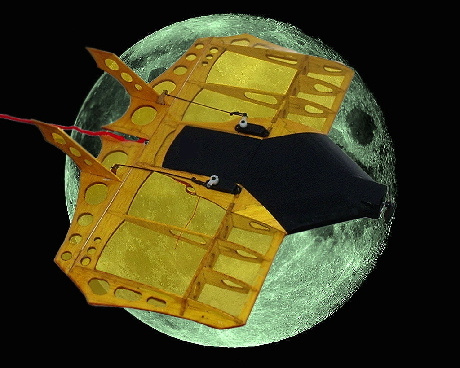 These folding props are for direct or geared drive applications. The folding hub is molded into the base of the plastic spinner assembly. All hardware, screws, etc included. These heavy duty folding prop assemblies are for direct or geared drive applications. The spinner and the hub are aluminum. The propeller blades are molded black plastic and attach to aluminum yoke with screws. 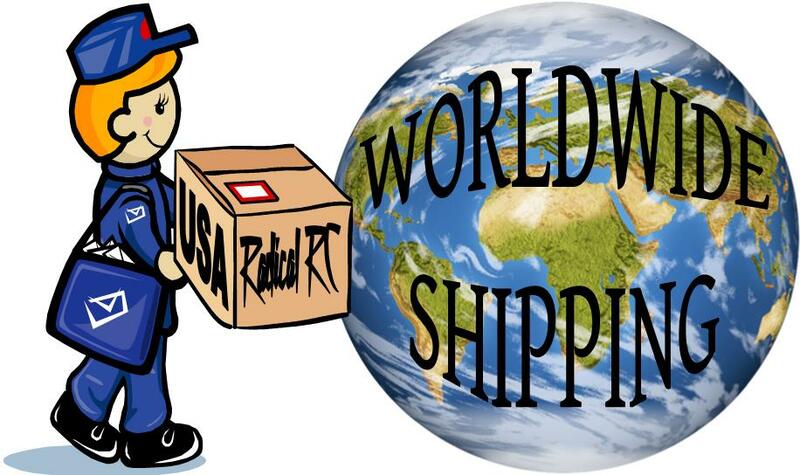 Choose desired spinner, shaft and prop size below. Note in this configuration, all props are black plastic and all spinner/hubs are aluminum metal. 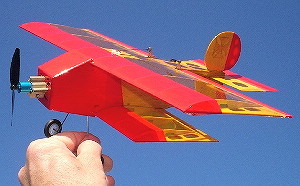 Refer to plastic spinner/folding prop photo to see assembled appearance. Maxx Flying #1103 Folding Prop Blade and Spinner Set for #540-550 size motors (3.2mm shaft diameter). Black, nylon/fiber spinner & gray, molded plastic propeller blades. Note: This is only size we carry of this product. Replacement blade set for your RRC folding prop size 6x3x6mm yoke. Blades only, no spinner or hub. Folding prop blade set size 6-3, 6mm yoke. Blades only, no spinner or hub. Replacement blade set for your RRC folding prop size 6x4, 6mm yoke. Blades only, no spinner or hub. Beefy 8mm yokes on a 6-4 blade set. Blades only, no spinner or hub. Beefy 8mm yokes on a 6-6 blade set. Blade length 2.375" (60.3mm). Blades only. Replacement blade set for your RRC folding prop size 6.5x4x6mm yoke. Blades only, no spinner or hub. Beefy 8mm yokes on a 7-3 blade set. Blades only, no spinner or hub. Folding blade set for your RRC folding prop size 7.5x4, 6mm yoke. Blades only, no spinner or hub. 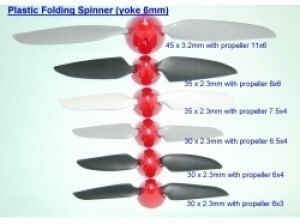 Folding prop blade set size 7-4.5, 6mm yoke. Blades only, no spinner or hub. Folding blade set for your RRC folding prop size 8x4.5, 6mm Yoke. Blades only, no spinner or hub. Folding blade set for your RRC folding prop size 8x6, 6mm yoke. Blades only, no spinner or hub. Folding blade set for your RRC folding prop size 9x5, 6mm yoke. Blades only, no spinner or hub. Folding blade set 9.5x8, 6mm yoke. Blades only, no spinner or hub. Beefy 8mm yokes on a 9-6 blade set. Blade length 3.840" (97.55). Blades only. Folding prop blade set size 10-6, 8mm yoke. Blades only, no spinner or hub. Folding blade set size 10x6, 8mm yoke. Blades only, no spinner or hub. Folding blade set size 10x8, 6mm yoke. Blades only, no spinner or hub. Folding prop blade set size 10x8, 6mm yoke. Blades only, no hub or spinner. Folding prop blade set size 11x6, 8mm yoke. Blades only, no hub or spinner. Folding prop blade set size 11x8, 6mm yoke. Blades only, no spinner or hub. Folding prop blade set size 11x8, 8mm yoke. Blades only, no spinner or hub. Folding prop blade set size 11-8, 6mm yoke. Blades only, no spinner or hub. Folding prop blade set size 12-6, 8mm yoke. Blades only, no spinner or hub. Folding prop blade set size 12x6.5, 8mm yoke. Yoke Pivot to tip 5.15" (130.8mm). Blades only, no spinner or hub. Folding prop blade set size 13-6, 8mm yoke. Blades only, no spinner or hub. Folding prop blade set size 13-9, 8mm yoke. Blades only, no spinner or hub. 8mm yokes on a 13x10 blade set. Blade length 5.650" (143.53mm). Blades only. Folding prop blade set size 14x8, 8mm yoke. Blades only, no spinner or hub. Folding prop blade set size 14 x 9.5, 8mm yoke. Blades only, no spinner or hub. Folding prop blade set size 15x13, 8mm yoke. Blades only, no spinner or hub. 8mm yokes on a 15.5x9.5 blade set. Blade length 6.772" (172mm). Blades only.